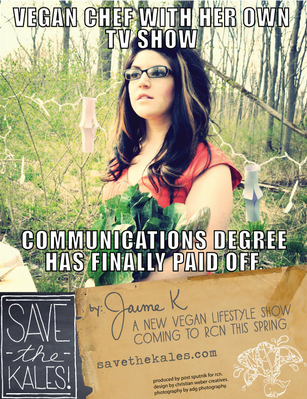 May | 2012 | Save the Kales! 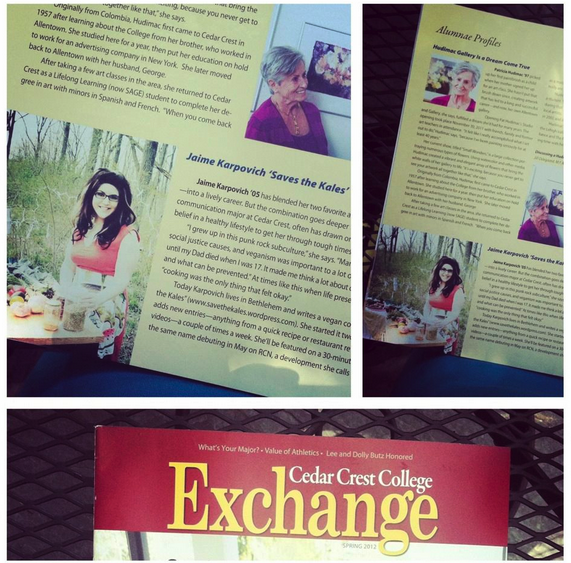 When I was contacted by someone from my college, where I was graduated in 2005, to see if I would be interviewed for the alumni newsletter, I was admittedly taken aback. See, the thing is, I had a lot of trouble finding a job in my field after graduating (and I didn’t want to move away) and I became really bitter and resentful that I bothered to go, and incidentally racked up student loans that I still don’t want to think about. Anyhow, this may be my favorite interview to date because I was able to touch on the ideas of trying to figure everything out and feeling let down and frustrated at times, but pulling through to create the life you want. Jaime Karpovich ’05 has blended her two favorite activities – writing and cooking – into a lively career. But the combination goes deeper than that. Karpovich, a communication major at Cedar Crest, often has drawn on her love of cooking and her belief in a healthy lifestyle to get her through tough times. 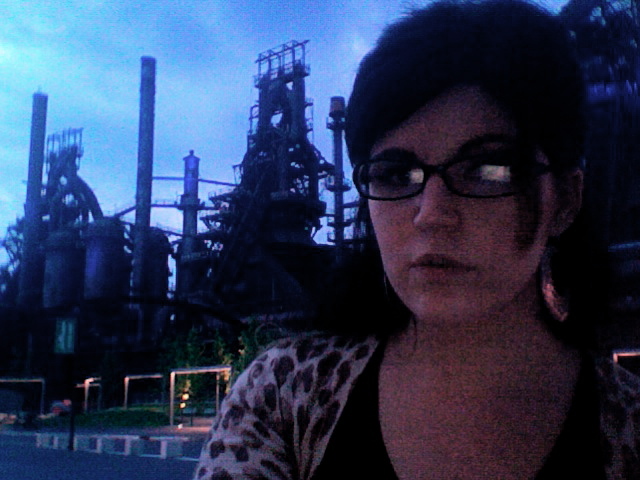 She also keeps busy as a freelance writer and helps organize Bethlehem Vegfest, and she’s on the steering committee to form a retail grocery co-op in Bethlehem. Yesterday had the sort of humidity that felt like you put your head in an oven upon walking outside. I don’t know why I bothered to cook a salad that required boiling stuff, but trust me, it was worth it hours later when the salad was nice and chilled in the fridge. I used a bunch of kale I had that was starting to wilt, but feel free to substitute or add other green things, like asparagus, green beans, or some peppery lettuces. Once again, this was inspired by Heidi Swanson’s Super Natural Every Day. Add potatoes to a large pot of boiling water and cook until just tender, not mushy, about 8-12 minutes depending on how big you cut them. 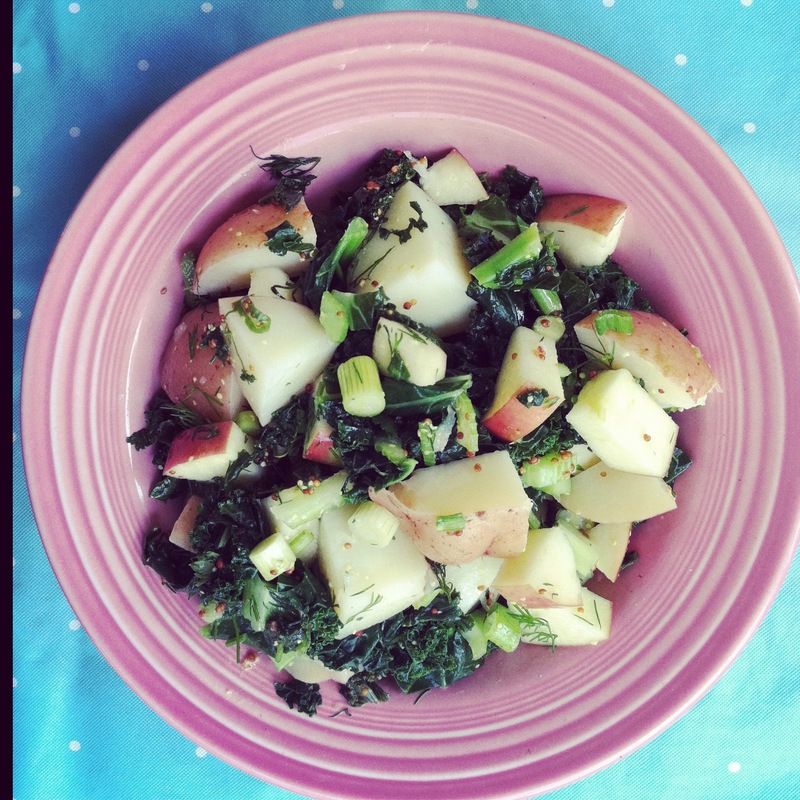 With just 2 minutes of cook time left, add the kale. Strain and run under cold water to stop the cooking. 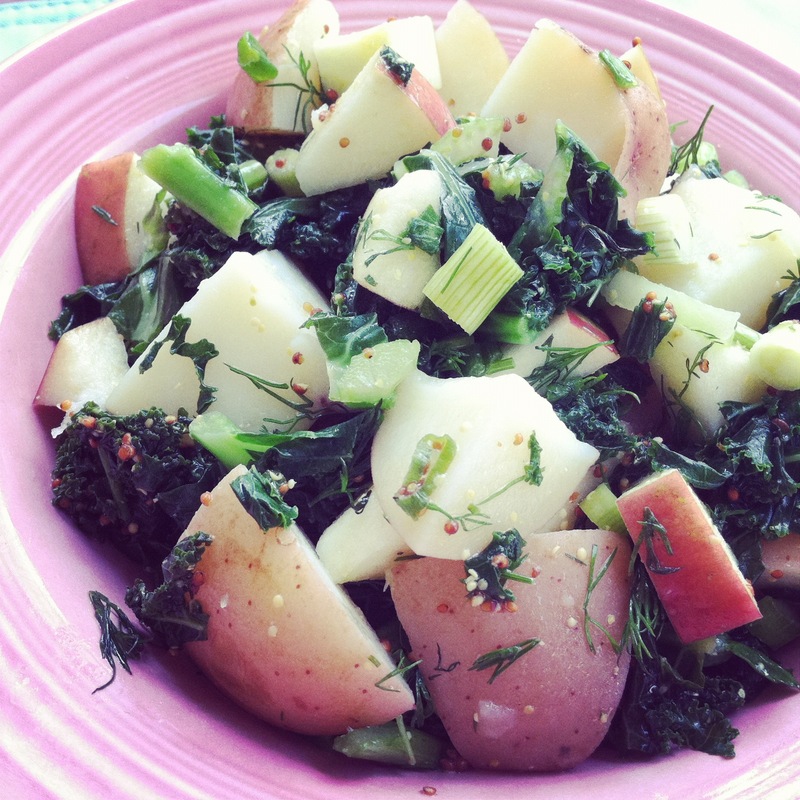 Put the potatoes and kale into the mixing bowl, add dressing, and mix with your hands gently as not to smush the potatoes. Let this chill a few hours before eating, overnight may be best. You can eat it as soon as you’re done, but it is so much better once it’s chilled. Patience is a virtue! Here it is! The first full episode! Wow! In this episode, we go to the Fresh Tofu, Inc. factory. President of the company, Gary, tells us about how they got started (a vegan food truck in the 1970’s – this guy is awesome) and you can buy their products in and around Pennsylvania, and they also supply to some “high profile” NYC restaurants and businesses. Then back at the kitchen, we make a Tofu Garlic and Basil “Ricotta” Pizza with Fresh Arugula and Lemon. PLUS my Sunday Morning Tofu Scramble — a true weekend staple in the Karpovich/Hill household. Finally, our friend Johnny Gee from the blog Johnnysized joins us to share the meal and talk about how going on a plant-based diet has helped him lose over 70 pounds (to date, currently) and get off ALL medications. You can find the recipes below. Have a pizza crust already cooked and ready to go! 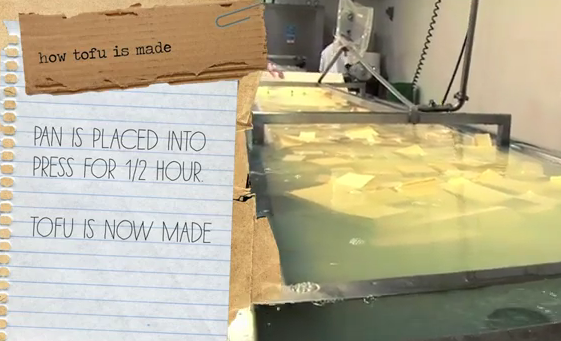 Cut tofu into 1/2 inch thick slices, lay on a clean towel, and press with your hands to get the water out. Put tofu in a food processor. Take all the leaves of a bunch of basil and add to the food processor, along with garlic, lemon juice, nutritional yeast, salt, and olive oil. Blend until smooth, stopping to scrape down the sides if needed. Drizzle olive oil on the pizza, then top with fresh arugula. Serve with a wedge of fresh lemon and guests can use it to add fresh lemon jucie to their own pizzas (or do this yourself ahead of time). Fresh cracked black pepper and some salt finish the dish. Press the water out of the tofu and set aside. Cut up the onion, mushrooms and peppers and set aside. In a large pan or skillet, heat up the onion and olive oil until onion is translucent, about three minutes. Add the mushrooms and cook for about three more minutes. Then add the peppers and cook for another 2-3 minutes. 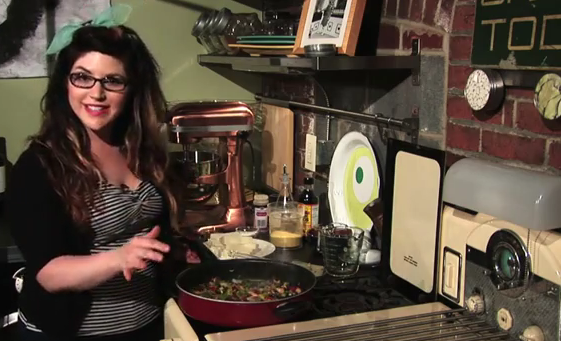 Once veggies are cooked, use your hands to crumble the tofu into the pan. Add Bragg’s (or soy or tamari sauce), garlic powder, turmeric, and dried basil. Mix everything. Add nutritional yeast and mix again. Salt and pepper to taste. 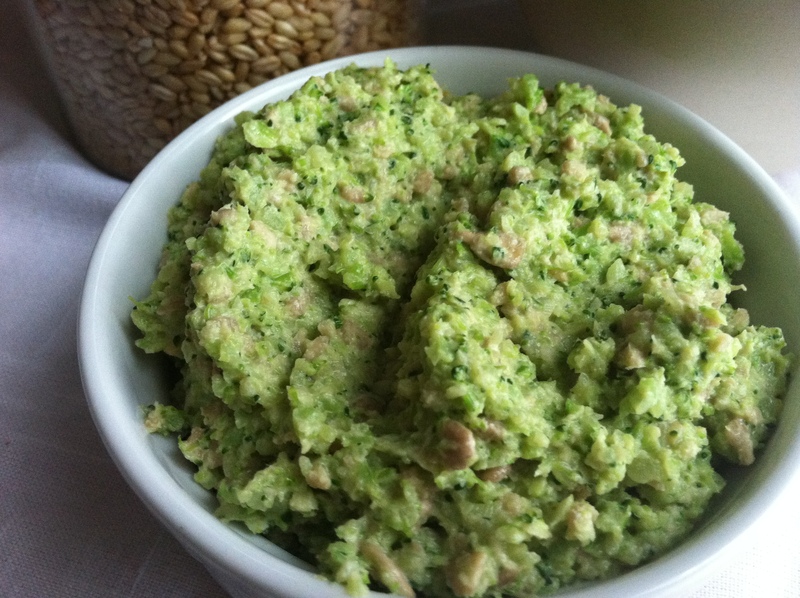 Top with avocado or fresh herbs, and this can be stored in the fridge for several days and eaten as-is or as part of a sandwich, salad or burrito. Come back for Episode Two which will be on air/online in June! We go to a local community garden, give some hearty comfort foods a healthier vegan makeover, and learn more about The Bethlehem Food Co-op. I took an hour this morning to have the “rainy Sunday” I missed out on yesterday. New magazines, coffee and reading cookbooks start-to-finish are my favorite things. Plus a new candle from Mercantile Home – my absolute favorite candles on the earth, ever, and they will be featured in my next “Little Spoon” guest blog for LV Style magazine’s website (new one out later this week). Cook the wheatberries in the water. This takes about 30-45 minutes. Wheatberries are dense and when fully cooked still have a sort of “al dente” chewiness. I love the texture. Once cooked, strain and set aside. Ingredients for broccoli pesto salad. Add the broccoli to a large pot of boiling water, and boil for 1-2 minutes, until just blanched and bright green but still crisp. DON’T OVERCOOK. Stay near the stove. Strain and rinse with cold water to stop cooking. 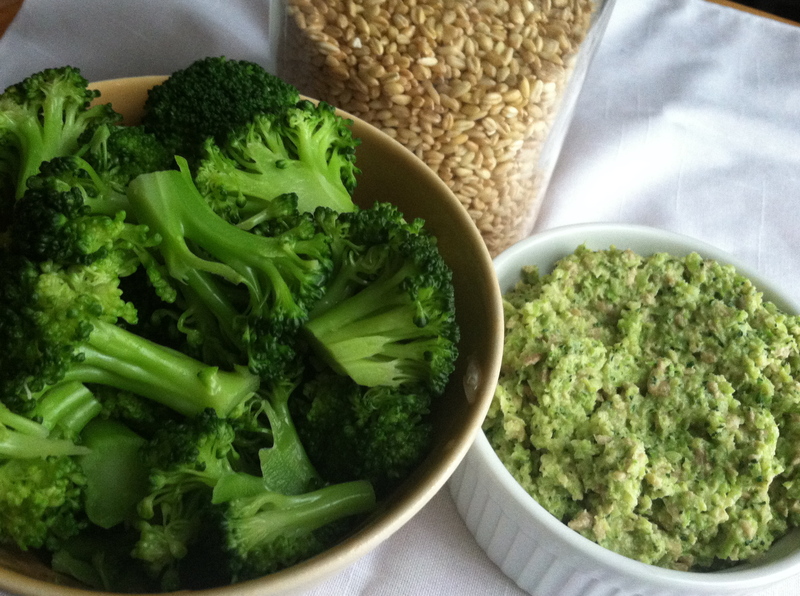 In a large bowl, add wheatberries, broccoli pesto, remaining 3 cups of broccoli, and avocado. Stir everything together. It will get really creamy thanks to the pesto and avocado. It will seem thick, but you won’t need to add any more oil (unless you want to), so just keep mixing. Salt and pepper to taste. Garnish with some dried red pepper flakes for a pop of color. 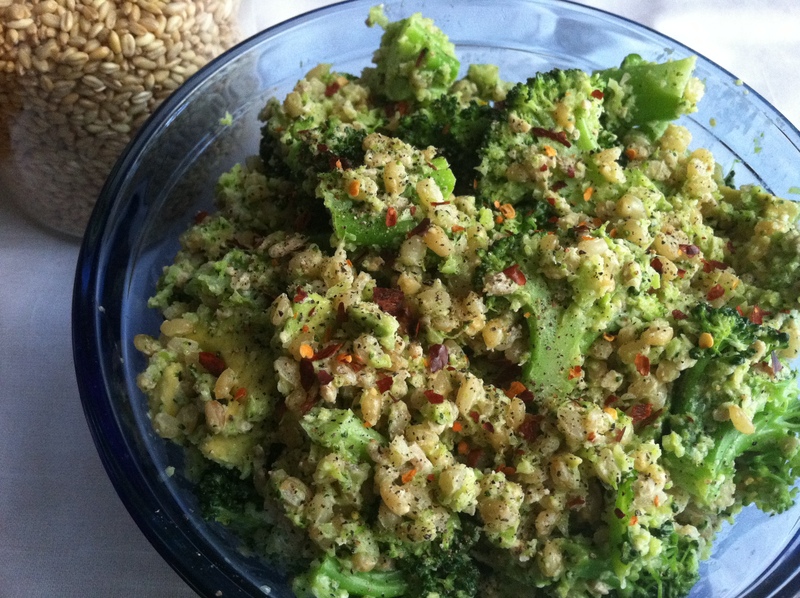 Wheatberry, avocado and broccoli pesto salad. *I have been using sunflower seeds in place of pine nuts in a lot of recipes lately. I buy a lot of dried fruit/veggies, beans and raw nuts from a market that sells them in pre-packaged bulk. The sunflower seeds are SIX TIMES LESS MONEY than pine nuts. They aren’t as “creamy” as pine nuts, and for some fancy recipes or when you have a party, you may want to use pine nuts. But for every day cooking and sticking to a grocery budget, they have yet to do me wrong. Hey everyone! 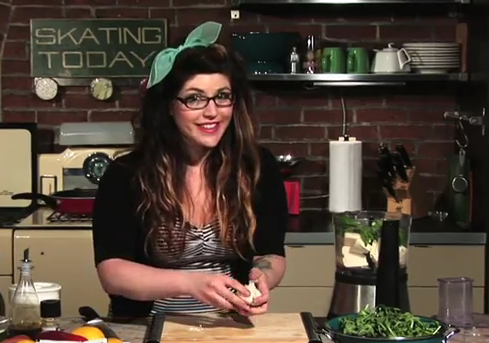 I’ve been getting a lot of questions from people about where they can find the recipes featured in the first show. I had planned to put them online in the same post as the first episode, when it goes online. It was supposed to be this week, but then my computer had a heart attack (see prior post), so that was pushed back a little. Pardon the lack of updates… My computer’s hard drive came thisclose to completely crashing (and I still needed a new one). I was able to salvage my photos and podcats, and everything else of value exists on the internet. However, I can’t remember our home’s wireless network password, so I’m stealing internet access where I can get it. Just last week, Ryan and I finally got to see The Muppet Movie, the new one. OH GOODNESS HEAVENS ABOVE, I CRIED SO MANY TIMES. Happy cry, sad cry, nostalgia cry, I-know-what-that-feels-like cry, people working together and isn’t it all so beautiful cry, crying-cause-you’re-already-crying cry… Tears were flowing. A box or two of tissues later, I did find it to be incredibly uplifting, and true to form, some excellent life lessons were tucked in along the way. “About three years ago, I was in a little off-Broadway play. I thought it was great and was proud of it. But one night after the show, at an audience Q&A session, a guy said, “Don’t worry about The New York Times.” I’d learned never to read reviews, but this confirmed that they must have been bad. And for a couple of days, that slayed me. I’d always thought that if I believed in what I was doing, people would respond well, even if they had different tastes. But at that moment I realized this was simply untrue. Then I thought, Maybe I’m completely wrong about everything. I became so sensitive to others’ opinions that I had a hard time saying, I know I love this, so who cares what everything else thinks? It took me a while – and it’s an ongoing challenge, to be honest – to stop seeking approval. But one day, and this might sound cheesy, I took my daughter, Ramona, to see the new Muppets movie. 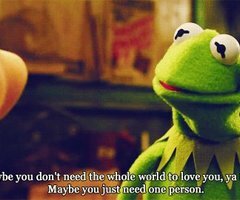 There’s a part where Kermit the Frog says, “Maybe you don’t need the whole world to love you, you know? Maybe you just need one person.” When I heard that, I started crying. There’s just so much pressure to be a great mother, wife, friend, actress, or whatever your job may be. If some aspect of you wants everyone to universally love and understand you and approve of everything you do – well, that’s a sad life. You’ll bend yourself into a pretzel trying to be all these things you think you’re supposed to be. I can say, without a tiny wavering doubt, this has been the biggest lesson for me in the last year. And I think it takes going up against some sort of opposition before you can learn it. It takes some sleepless nights and sick-to-your-stomach days before you can come out the other side and realize one negative opinion doesn’t mean more than your opinion, and your opinion is that you’re doing all you can to be great. Oh. Thank you Kermit, Maggie and Oprah.